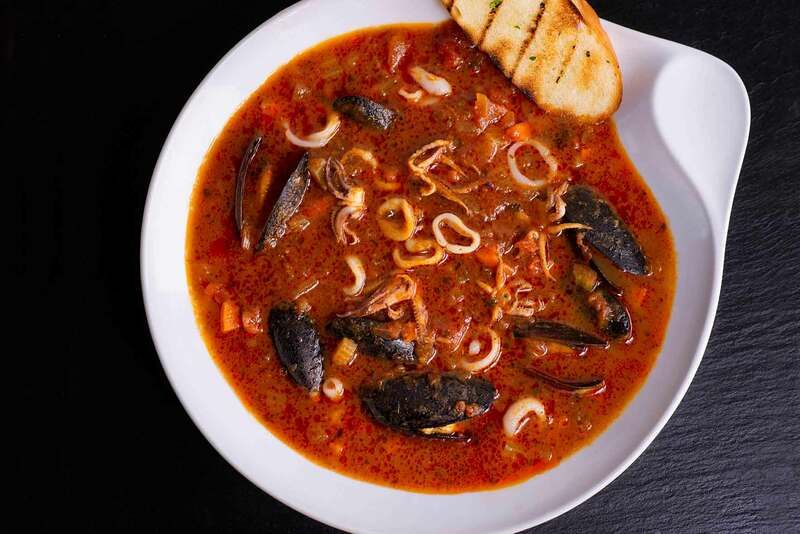 A classic cioppino made with tender Calamari Rings and Tentacles, mussels, diced tomatoes, white wine, garlic and herbs, served with grilled toast points. In large saucepot add the olive oil and sauté the white onion on medium heat for 1-2 minutes, or until the onion is translucent. Add in the garlic, salt, black pepper, allspice and red pepper flakes and sauté for another minute. Deglaze the pan with white wine and simmer for 3-4 minutes, or until the wine has reduced by half. Add in the tomatoes, fish stock and bay leaves, then bring to a simmer and cook for 30 minutes on low heat. Add in the Calamari Rings and Tentacles and mussels, then cook for another 5 minutes, or until the mussels have opened.